The Stendig calendar is an institution. It has the prestigious claim to being the only calendar to be in the MOMA, and I mean, can you blame them??? ITS GORGEOUS! 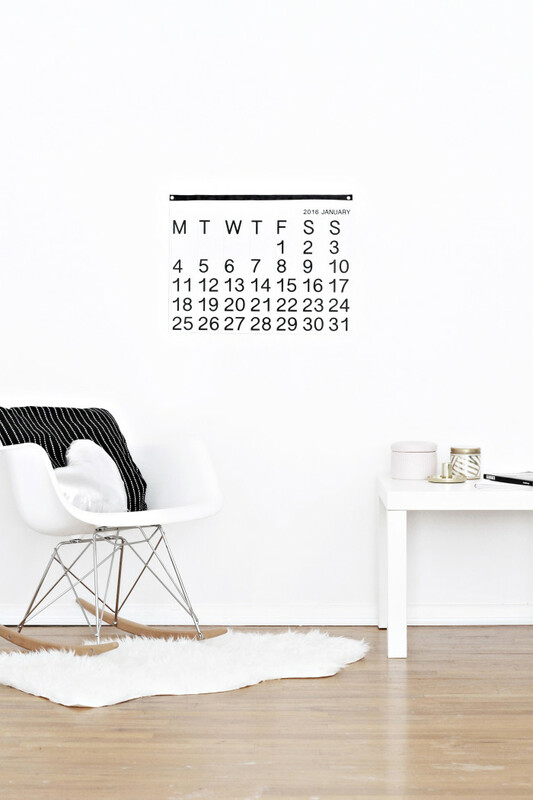 Unfortunately I didn’t even know about the existence of this calendar until a little over a month ago (I feel stuuupid…) and the 2016 release of it is already sold out!I found some still available online for about $150. Which, for the size (and beauty) of it, that really is not a bad price. It’s just not a price I’m willing to pay. So I made my own! I included enough variation in the design so it’s not an exact copy by any means but it still has the minimal design appeal that I love in the original. 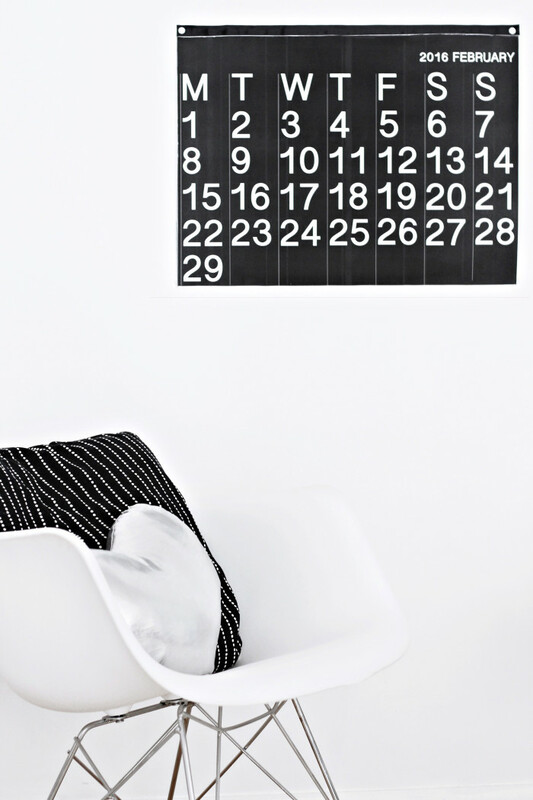 This calendar was actually SO EASY to put together, the hardest part by far was actually designing it and LUCK YOU, I’m making that part available for you for free! Staples does large format prints, called engineer prints, in black and white for a super inexpensive cost. 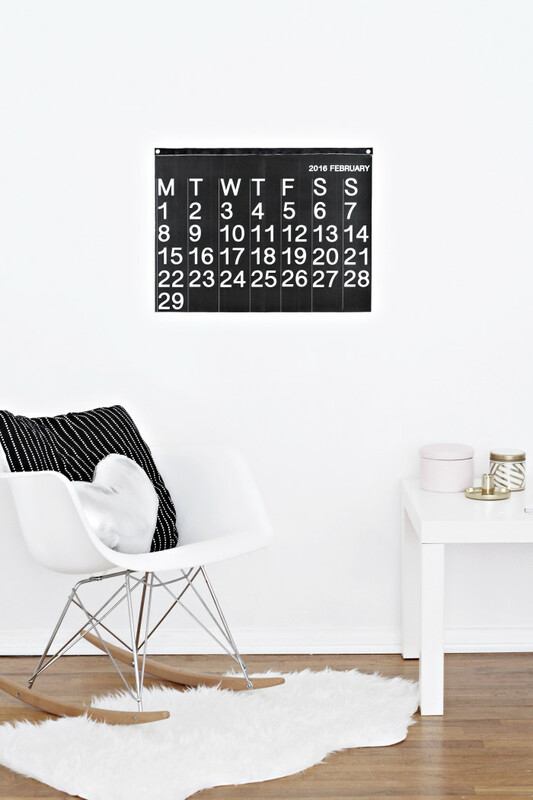 I decided to go with a much smaller version of this calendar (the original is 36″ x 48″ and mine is only 18″ x 24″) basically just to keep it super cheap and since I just moved into my house, I wasn’t sure exactly where I wanted this to go and how it would all fit together. I still think it’s large enough to make a statement and be an artwork in itself but it isn’t overwhelming, and it only cost about $20! 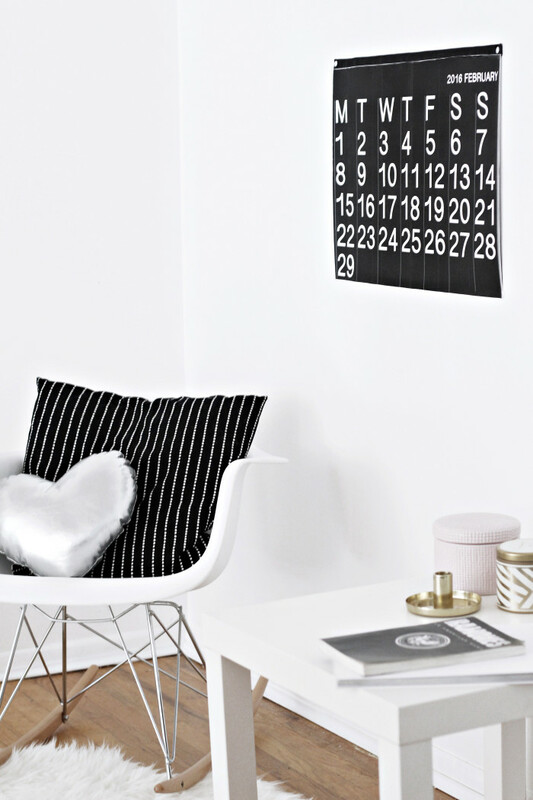 The original calendar goes from black to white every other month and I love that, but if you’d like the whole thing black or white, or want to switch the months since we’re already over a month behind, I made options for all of those possibilities! So click through and download whatever works for you. 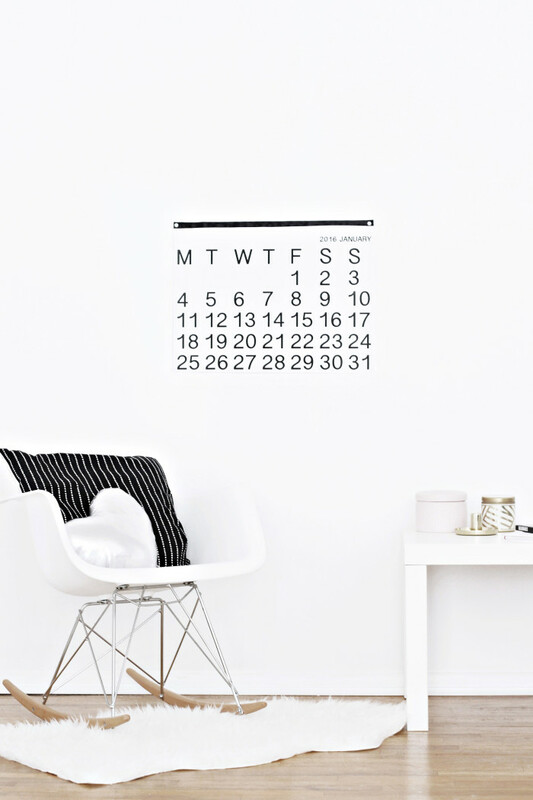 Get your calendar printed. I always use Staples engineering prints cus they are so cost effective and always turn out great! 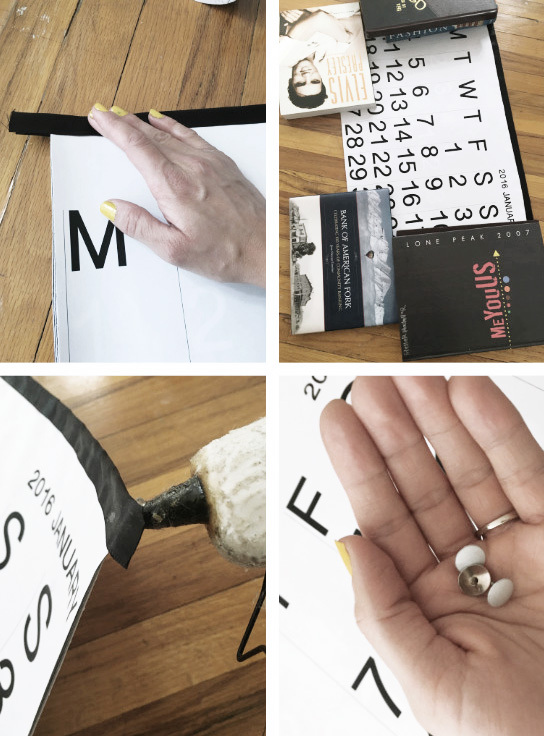 When you get your calendar, it will probably be rolled up and you’ll want to put it under something heavy to help flatten it out. I have considered just leaving a note next time I ordered and asking them to not roll them up but I don’t know how well they can really accommodate this and I’d definitely encourage you to pick them up same day they’re available if you ask them to do this. So my calendar actually didn’t end up being 18″ x 24″ because the prints didn’t go all the way to edges which I was disappointed about. Maybe I didn’t click the option that said to print it full size but most likely they just don’t print this way. So I cut around all of them, two at a time with a black on top to go by. Apply glue stick just along the top edge of the last month (Dec 2016) and then place Nov 2016 on top of that. Repeat for all the remaining months. Don’t do your glue too far down because when you remove the previous month, you’ll see glue marks, especially on the black ones. Cut a length of ribbon a little bigger than the calendar. Apply glue (I used and love Tack Glue) to the whole underside of that ribbon. Press your calendar on top of the ribbon, about half way up it. 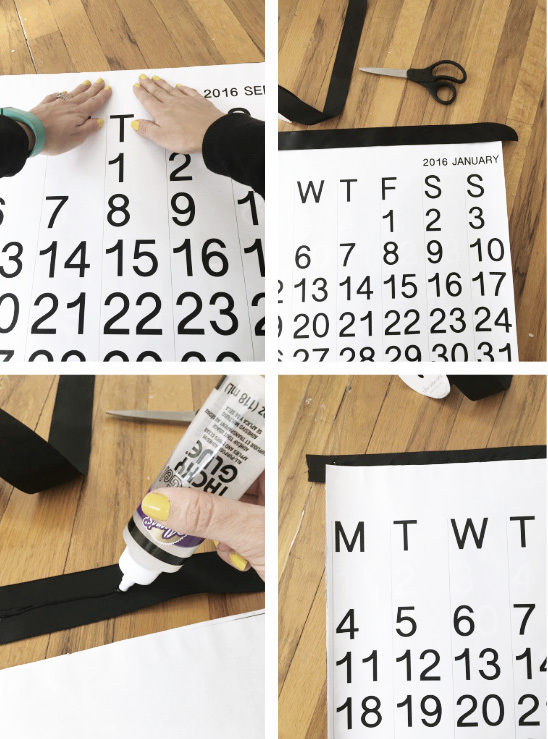 Press the rest of the ribbon over the top of the calendar. My calendar still had more roll than I wanted so I placed heavy books on top of the edges again for overnight. Glue the edges of the ribbon back behind the calendar (I used hot glue). Use thumb tacks (and a level ;D) to attach to the wall! 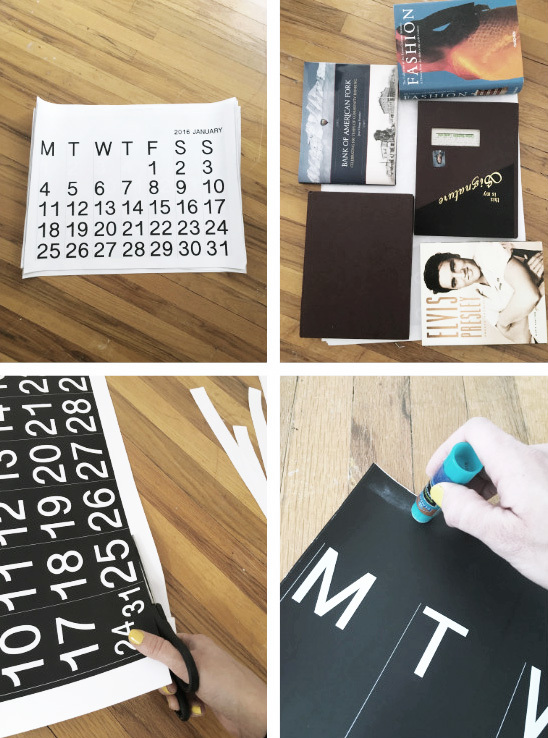 To get to the next month, use an Xacto knife (or scissors but it’s harder) to cut the past month off. Love this!! Thanks for putting in the hard work! Can this be printed in a larger size? Or will it only work in the size you printed? Thanks!